PARTICIPANTS IN FMC SUPPLY CHAIN INNOVATION TEAM INITIATIVE INCLUDE PORTS, TERMINAL OPERATORS, SHIPPERS, INTERMEDIARIES, LABOR, RAILROADS, TRUCKERS, AND CHASSIS PROVIDERS: Academic advisors to the team will include John’s Hopkins, the University of Denver, and MIT. FMC’s Supply Chain Innovation Team Initiative will kick off in Washington on May 3. FMC initiative will bring together leaders from across the ocean transportation supply chain. FMC initiative will include three multi-industry teams to discuss supply-chain challenges. Federal Maritime Commissioner Rebecca Dye recently briefed her fellow commissioners on the upcoming May 3 launch of the FMC’s Supply Chain Innovation Team Initiative. The two-day inaugural meeting, to be held at the FMC’s Washington, D.C., headquarters, will bring together industry leaders from across the international ocean transportation supply chain. Three small multi-industry innovation teams will begin discussion on supply-chain challenges by identifying actionable process improvements. 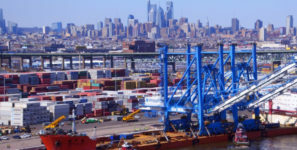 Industry participants include ports, terminal operators, shippers, ocean transportation intermediaries, labor, railroads, truckers, and chassis providers. Academic advisors will include John’s Hopkins University’s Applied Physics Lab, the Transportation Institute at the University of Denver, the New York Shipping Exchange, Strategic Mobility 21, MIT’s Center for Transportation and Logistics, and others. “The goal of the 36 participants in our three innovation teams will be to develop actionable commercial improvements, and move beyond discussion to action,” said Dye. She described the FMC’s role as that of a catalyst in the process. In an effort to modernize and automate its business processes and in direct response to industry requests for an automated agreement filing process, the commission also voted to issue a direct final rule that would permit optional electronic filing of ocean common carrier and marine terminal operator agreements. In connection with the rule, staff presented a newly developed web application that will facilitate the electronic agreement filing option under the rule, as well as support a significant upgrade to the commission’s existing online agreement library. The web-based agreement filing system and the upgraded Online Agreement Library will be publicly available when the direct final rule goes in to effect. The commission also issued a Notice of Proposed Rulemaking to update and reorganize several subparts of its rules. Both rulemakings are subject to a period of public comment before they go into effect.